Steve Day qualified at Birmingham University Dental School, in 1977. Following qualification, he worked in the maxillofacial surgery unit at Wolverhampton's Royal and New Cross Hospital's where he gained experience in the treatment of head and neck trauma and disease. Further to the experience gained in the hospital environment he left Wolverhampton to work part-time in general practice and continued with his hospital work at East Birmingham Hospital, in the oral surgery department. 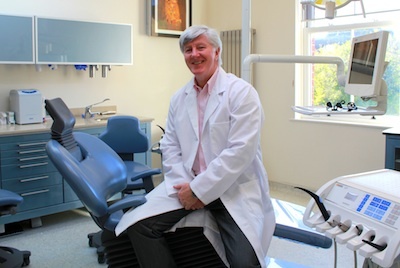 In 1983 Steve Day began his own practice in Sutton Coldfield, West Midlands, and continued to work in general practice but pursuing his other specialist interests in endodontics, oral surgery and implantology. Besides general dentistry, Steve has continued his postgraduate studies in prosthodontics and occlusal studies. These areas of special interest have allowed him to develop the skills required for not just a broad spectrum of clinical techniques but also the competence and experience necessary for full mouth surgical and cosmetic reconstructions. Steve Day is a member of the international team of Implantology, the British Endodontics Society, the British Periodontal Society, the International Academy of Advanced Facial Aesthetics and British Association of Cosmetic Dentistry. In opening the new KClinic, we hope to bring to Cheshire, our experience and expertise in an environment of a modern, state-of-the-art surgery, achieving a relaxed and congenial atmosphere, where patients can be offered the full range of dental care.